Siemens Gamesa Renewable Energy, a global leader in the wind power industry, has posted a net income of €70 million ($79.7 million) in FY 2018, including the impact of integration and restructuring costs (€176 million). The company also registered a revenue of €9,122 million ($10.4 billion) for the full year ended September 30, 2018. EBIT pre-PPA, restructuring and integration costs was €693 million with an EBIT margin at 7.6 per cent, The EBIT margin is impacted by double-digit price decline in onshore wind turbine business partially compensated by synergies and productivity and the strong performance in service. The company increased its net cash position to €615 million at September 30. In the fourth quarter (Q4) the company’s financial performance was strong, with revenue growth to €2,619 million (+12 per cent YoY) driven by the recovery of onshore volume and a high level of offshore project execution, with an EBIT margin (1) at 8.2 per cent. Net income amounted to €25 million. The guidance for FY 2018 (revenues of €9-9.6 billion, EBIT margin (1) of 7-8 per cent, working capital of -3 per cent-3 per cent and capex of €500 million) was successfully achieved, laying the groundwork for profitable growth. In FY 2018 the company resumed strong commercial activity, with order intake of €11,872 million (+9 per cent YoY), boosted mainly by a recovery in onshore order intake (+30 per cent, to €6,682 million). Intense activity in offshore, with good progress in new markets, raised order intake to €2,795 million. During the period, the company signed its largest-ever offshore order – an agreement to supply 165 turbines to Hornsea II, the world’s largest offshore wind farm to date. Within Service, the company signed contracts worth €2,395 million during FY 2018. Siemens Gamesa achieved a new record backlog of €22.8 billion (+10 per cent YoY), providing enhanced visibility for 2019 and beyond and reaching revenue coverage of 80 per cent for FY 2019. The company has set the guidance for FY 2019: revenues of €10-11 billion and EBIT margin of 7-8.5 per cent, on track to meet FY 2020 targets based on financial framework launched at CMD. 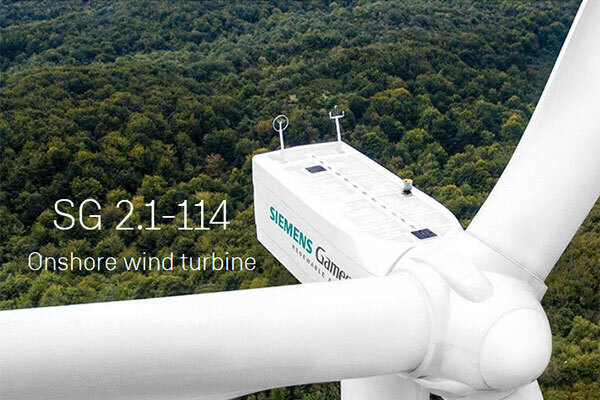 Siemens Gamesa also appointed Christoph Wollny as chief operating officer (COO). This newly-created function will support to better address current and future market dynamics and further strengthen cost-cutting efforts.